The most popular books with my 6th graders this year were YA novels that became movies (Divergent, Hunger Games, The Fault in Our Stars, etc). This is probably partly because those books got so much publicity (plus they are awesome). My students usually don’t think to ask their friends or teachers for good book recommendations, so I created a project where my kids broke down the elements of their favorite books and practiced sharing their favorites with the class. My favorite novel is A Confederacy of Dunces by John Kennedy Toole. It is a quirky, laugh-out-loud funny, off-beat type of book that I picked up during my freshman year of college after a recommendation from my friend Lauren. (See how useful recommending books can be?). 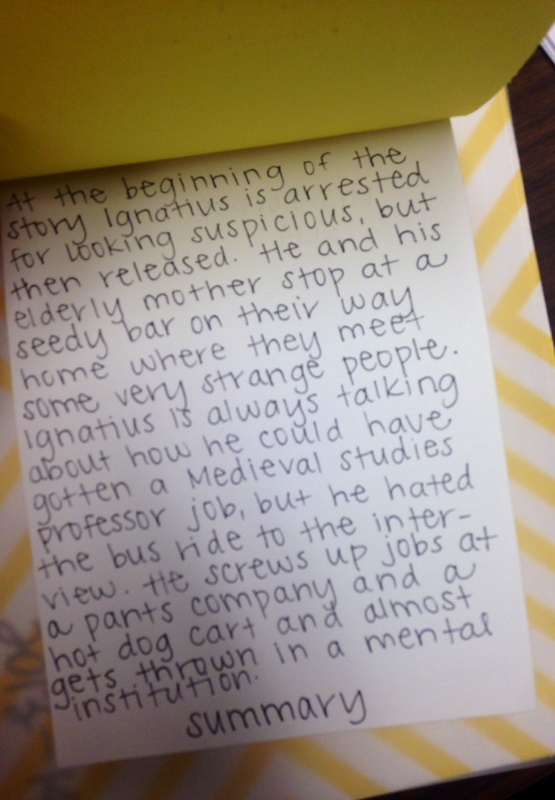 I based my example off of this novel. I’m not a great artist, but I copied an element of the cover of the actual book and did my best to match the font. I required my students to draw cover art as well. I wanted the Setting tab at the top because that is the smallest tab to write on. 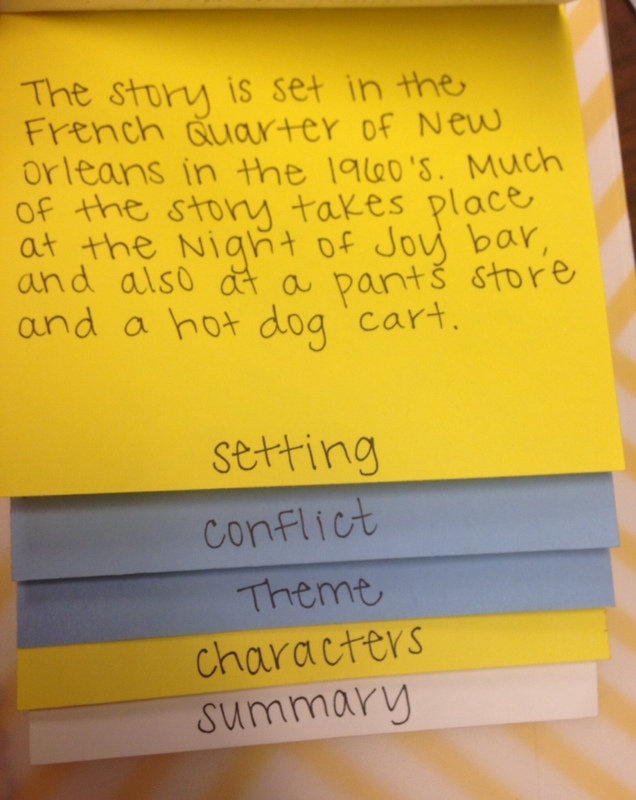 I listed each category in order by how much room students would need to adequately explain that element of the story. (P.S. 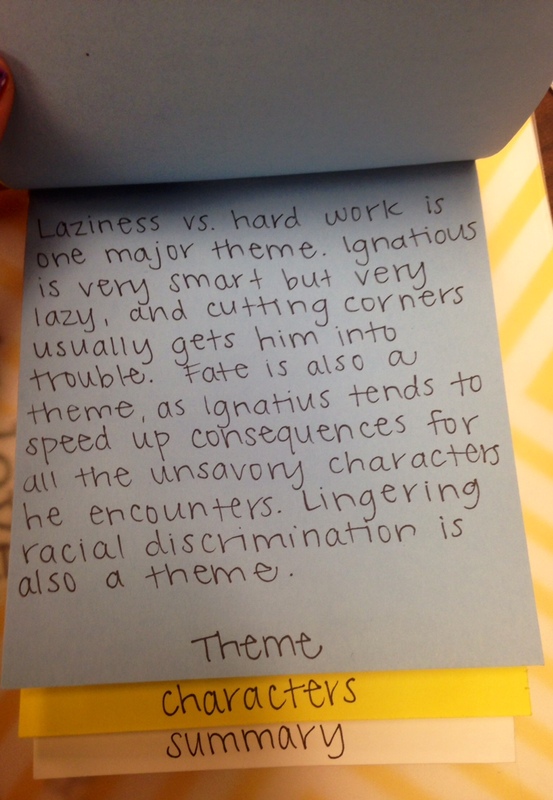 My writing is quite crude and simple in each of these examples so that it could serve as a realistic 6th grade model). The conflict is where I wanted my students to draw other people in. They needed to explain enough about the story to get readers interested, without giving away the resolution. The crazier the details about the story, the better! This is generally the hardest section for students to complete, but theme is something that we have been working on identifying all year, so it also served as a bit of a cumulative assessment. I remind them to consider the question, What does this book say about how life works? There is really only enough room here to list two to three characters. 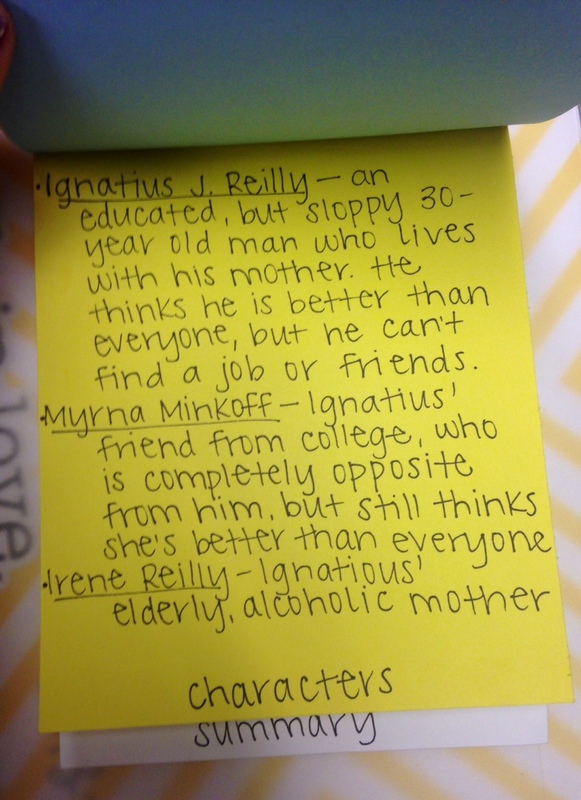 I asked students to just list the characters and then give a brief, but colorful description of each one. 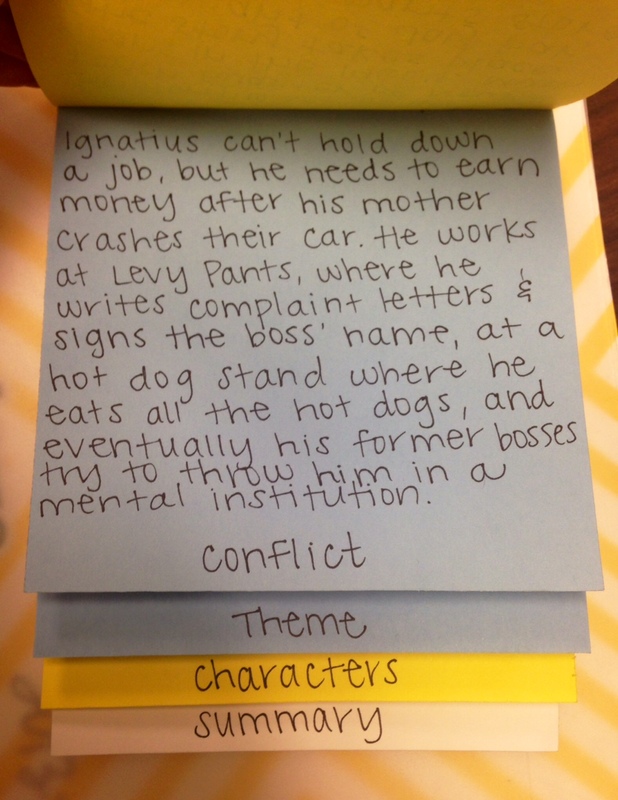 As with the conflict section, the summary should leave readers interested in finding out more about the story. There is no need for elaborate explanations. Students should simply try to hook other students into wanting to read the full book. And there you go! This project took two class periods, lots of construction paper, and my big box of colored pencils. 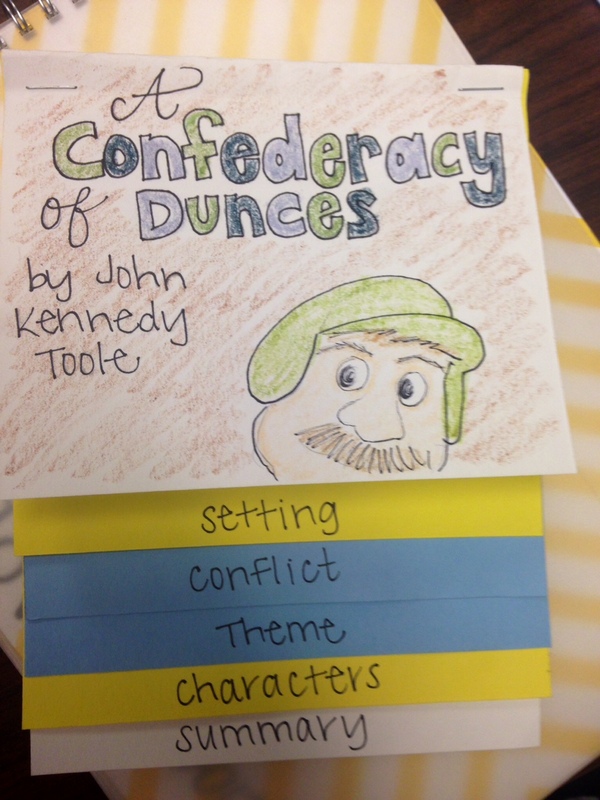 I made the blank foldables, and I told students to bring copies of their favorite book from this school year. I kept the completed projects, so I am going to make a display board at the beginning of the school year so that my new students will have plenty of book recommendations at their fingertips. As they worked, I also played this YouTube video by BooksAndQuills to encourage my students to seek out book recommendations and discover new books.